It’s a challenge that all commercial fit-out companies and contractors will appreciate – glass door thresholds can be a weak spot where the containment of air or noise are concerned. Furthermore, any likely solutions tend to be functional but not necessarily stylish. In perfect answer to this, Reddiplex has now introduced G2G Dropdown Seal – a unique solution that delivers both on aesthetics and performance. Once installed, the innovative seal will prevent the passage of air through the door and notably reduce sound escaping via this route, whilst not affecting or compromising any day to day usage. 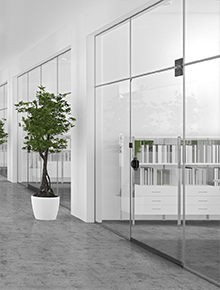 This can be an important feature in commercial office developments, where large glass panels and doors are desired to create an open feel and yet confidentiality is still important for particular offices. 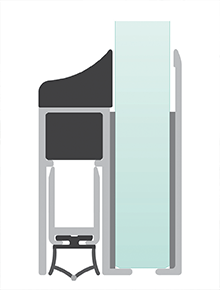 Now part of the existing G2G door seal range and suitable to use alongside the many profiles designed for door thresholds, G2G Dropdown seal can be installed on framed and frameless glass doors, accommodating a threshold gap up to 14mm. Such is the product’s flexibility, it can be supplied in various sizes from 935mm to 1135mm and can also be cut to size onsite using standard tools. It’s non-handed too, meaning that you can fit G2G Dropdown Seal to left and right-hinged doors, simply by reversing the plunger using a crosshead screwdriver. G2G Dropdown Seal looks good and performs to a high standard, whilst being extremely quick and easy to install. In fact, it offers the benefits that are typical of our G2G dry jointing brand and we’re delighted to add it to our range. We are continually striving to ensure that Reddiplex products add as much value as possible to your project and we constantly monitor the market to ensure that our product development programme is addressing any key trends, performance gaps or new requirements. We’d be very happy to tell you more about our G2G dry jointing products, or discuss how they might enhance your project. Please do phone us on 01905 795432 and we’ll be pleased to help you.